Two limited-edition malts, Ledaig 19 Years Old and Tobermory 21 Years Old, have been released by Distell's Tobermory Distillery. 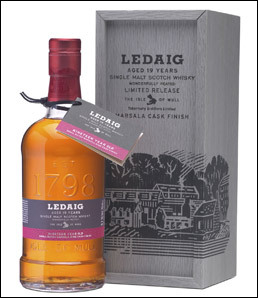 The Ledaig 19 Year Old (51% ABV) is some of the first spirit distilled when peated single malt production commenced at Tobermory distillery in the late 90s. Peat-dried malted barley was married with naturally peat-infused water from a lochan high in the mountains above the village. The spirit was then matured in superior oak wood casks before being finished in Marsala wine casks. Ledaig 19 Year Old will be available in specialist whisky outlets worldwide with an RRP of £125. The second special release is an unpeated Tobermory 21 Year Old (53.8% ABV – cask strength) with a Manzanilla cask finish. Non chill-filtered, it is amber gold in colour with notes of citrus, dried fruits, rich oak and orange spice. Limited bottles of the edition will be available in the US, Canada, Europe and Asia as well as at the distillery on Mull at an RRP of £130. Situated on the coast of the Isle of Mull, Tobermory is the island’s only distillery and is known for producing two different single malts. Carina Gous for Distell’s Malts Portfolio, says: “True to its heritage, Tobermory produces traditional, unchill-filtered malts. The wonderfully peated Ledaig and the light, unpeated Tobermory edition reflects the rich past of what is one of the oldest commercial distilleries still in operation.